Florida is home to a thriving population of urban and suburban swelling people. There are 30 different metro areas in our state which house over 15 million people, making Florida one of the most urbanized states in the county behind only New York and California. This makes Florida an exciting place to live — constantly evolving year after year as more people move here for the great weather and lack of state taxes. However, there are drawbacks to living in a densely populated area — mainly transportation. Golf Carts are a great way to get around Florida so long as you know the laws which govern them. Cars are expensive to maintain, fuel and ensure — not to mention the traffic they create on our public roads lead to pollution and slower commute times. In response to this many Florida residents have found alternative ways of transportation, whether that be a bicycle, public transportation, ride-sharing app or even a golf cart. Newer residents may be shocked to find how many golf carts they’ll find on public roads in Florida, especially in the suburban areas surrounding our major cities like Jacksonville, Orlando, Miami and Tampa. Why so many golf carts you ask? Could it be our state’s fascination with the sport of golf? Afterall Florida is home to the PGA Hall of Fame and hosts dozens of major professional tournaments every year. Could it be there’s a hint of truth to the stereotype Florida is full of retirees? Older residents of Florida don’t need cars to get around their retirement communities, so many of them opt for the ease and convenience of riding their golf cart instead. As an example, many areas and communities in The Villages, Florida have dedicated golf cart paths. If you’ve thought about making the leap to purchase a golf cart, Guy DiMartino applauds your willingness to lend a hand to the environment and help decongest our roads. Before you run out to purchase a golf cart there are some things you should know about how Florida laws govern the use of golf carts on our public roads. First, it’s important to define what a golf cart is by the state of Florida’s standards. According to the statute, Florida says an LSV (low-speed vehicle) is defined as a four-wheeled electric vehicle whose top speed is greater than 20 mph but less than 25 mph. Did you know in Florida golf carts cannot be manufactured to run over 20 mph? Some golf carts can fall into this category, but more often than not you’ll be hard-pressed to find an electric golf cart traveling over 20 mph. Regular golf carts can be driven by anyone over the age of 14 on a public road where the posted speed limit is under 25 mph. Remember, if you’re 14 and driving a golf cart on the road you are required to know the laws of driving. So read up! The minute that golf cart exceeds speeds of 20 mph, it becomes an LSV and is subject to a totally different set of rules. LSV’s require a regular operator license to drive and need to be registered at your local DMV with a tag and by Florida law must be insured like a regular vehicle. That insurance must carry the Florida PIP (personal injury protection) minimum policy, though Guy DiMartino and his attorneys highly recommend anyone with an LSV cover it with bodily injury, uninsured motorist, and medical payment coverages too. So can I only operate my golf cart in residential neighborhoods? Essentially the answer to this question is yes, but there are some exceptions. 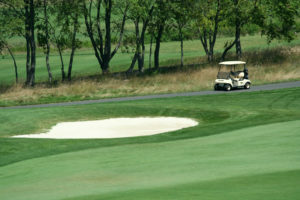 The law in Florida states a golf cart can be operated on roads designed for use by golf carts. This is a tricky way to word the law because designation of “golf cart roads” can change from county to county. The law in Florida requires counties to post signage like this: (insert golf cart sign picture here) to inform residents of where golf carts can or can’t be driven. To be extra careful, Guy DiMartino would strongly urge anyone who owns a golf cart in Florida to check with their local authorities about how golf cart roads are defined in their area. An example of an exception is on Florida highways. Florida statute 316.212 section three says a golf cart can cross a state highway so long as it divides a subdivision, mobile home park or golf course. So for example, if you have to cross a state highway to get from one side of your neighborhood to another you are allowed to do so. Remember, all of this jargon is for GOLF CARTS only. LSV’s can ride on any road where the posted speed is under 35 mph. County portions of Main Street from Canal Street to Dixie Avenue and from U.S. Highway 27 to Ninth Street. However, golf carts are not allowed to cross state roads including North Boulevard (U.S. Highway 441) and Dixie Avenue (State Road 44) in Leesburg, which are maintained by the state Department of Transportation. Leesburg changed the law to come in line with other local communities like Tavares and Howey-in-the-Hills. If my golf cart has headlights can I ride at night? Always double check with your county or neighborhood to see what the rules are regarding golf carts on the road. The broad, sweeping rule over the state of Florida says a golf cart can only be operated between the hours of sunrise and sunset. However, different local governments can have different laws that can define when you can ride your golf cart. For instance in The Villages, Florida you can operate your golf cart at night if it has headlights, brake lights, turn signals, and reflective warning devices on the front and rear sides of the golf cart. Also, you should use your headlights 30 minutes before sunset and 30 minutes after sunrise. Finally, you need to have your headlights on in the rain. 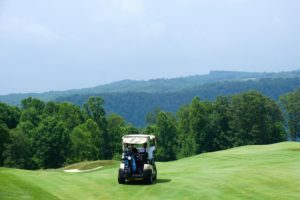 If your county is one where you can ride a golf cart at night, it’s common practice the county will require the vehicle to have headlights, brake lights and windshields.You aren’t required to have electric turn signals, but if your golf cart lacks them you need to know how to signal with your arm. (Insert a picture of physical arm signals here). If you are pulled over in a golf cart, authorities may also look for a rear-view mirror, reflective warning devices on the front and back. Guy DiMartino and his attorneys would highly recommend all golf cart drivers in Florida to make sure their vehicle meet all these specifications as to avoid any trouble. Can I modify my golf cart to make it go faster in Florida? To a certain extent, yes. But let’s be clear: Guy DiMartino does not recommend anyone in the state of Florida modify their golf cart as it can often be unlawful and unsafe. Remember, the minute a golf cart exceeds speeds of 20 mph it is an LSV and requires a license, registration tag, and insurance. Not to mention an insurance company will more than likely refuse to pay for any damages to a modified cart. In addition to all that, a driver can put their safety at risk by modifying their cart. Manufacturers design these vehicles to only handle speeds of 20 mph — anything faster can cause the golf cart to flip to overturn. Overturning carts are by far the most common injury suffered in golf cart accidents and your case can be made very difficult if your golf cart is found to be modified past factory standards. Can I get a ticket while driving a golf cart in Florida? The answer to this question is an overly resounding yes! Local and Florida state authorities will be more than happy to give you a ticket if they find your golf cart in violation of any state or local statute. This includes speeding, riding on illegal roads and even DUIs. Yes, you can be issued a DUI for driving a golf cart. Don’t become the next “Florida Man” headline in the newspaper and drive your golf cart responsibly. If you follow all these rules and drive responsibly, your golf cart and LSV driving experience will be a safe and enjoyable one here in Florida. However, even if you drive your golf cart or LSV perfectly safe you can still be struck or hit by other negligent drivers on the road. When and if this happens, the attorneys at Guy DiMartino are here to help you receive the care you need if you’ve been the victim of a golf cart accident in the state of Florida. If you or someone you know has been involved in a golf cart accident and don’t know what to do call 352-329-0329 for a free consultation today.